Clean Room Classification aspects of cleanroom requirements in aseptic Process in manufacturing of sterile dosage form. Clean rooms in pharma industry are arias which are specially designed to reduce and eliminate, particulate and microbial contamination in environment in aria used for manufacturing of pharmaceutical dosage forms, especially parenteral dosage forms which are required to be injected directly into body and blood stream are required to be free from viable microbial contamination as well as comply with the requirement of particulate matter present in addition to requirement of absence of pyrogen. Controlling particle count in air supplied to manufacturing aria is achieved by filtering air entering inside through high efficiency particulate filters which are capable of removing 99.997 % of particles from air in rage of 0.3 micron and more. There are many techniques combined together to achieve required level of cleanness, like more is the volume of air filtered per unit time (per hour) more is the cleanness of clean room. ULFA filters are used to remove lower size particles. Particulate matter are carriers of microorganisms hence reducing particle count directly reduce microbial contamination. Requirements of or classifications of clean rooms in pharma manufacturing unit where sterile dosage forms are being manufactured are laid down by various agencies worldwide of which following are important one. Guidelines used worldwide to classify clean rooms in pharma industry. 1) US Federal standards in good manufacturing practices guidelines in 21 CFR Part 210 211. 3) European Union standards as described in Guide for good manufacturing practices for medicinal products manufactured for sale in Europe. We have given below in details major requirements of each guidelines, and their advantages. 1. United states Federal Standards 209E. Clean room are classified as class 10 to 10000000, read below in detail. These guidelines also classify clean room aria as 1) Controlled aria clean room 2) Critical aria. Controlled area is used for compounding, and manufacturing process where in final product is made sterile in later stage, by terminal or filtration sterilisation( Class 1000, 10000). While critical aria is an aria where in products is exposed to external environment hence this environment must prevent contamination of product, (Class 100), Microbial count requirements as per US Federal regulation. Critical area: Not more that 0.1 colony forming units per cubic foot. Controlled area: Not more that 2.5 colony forming units per cubic foot. EU guidelines require that clean room meets standards in operation and as well as at rest. It also require that particle count measurements should be done with in one foot distance of working point. High Efficiency Particulate Air filter, A velocity of 0.45 meters/second (90 feet per minute) has generally been established, with a range of plus or minus 20 percent around the set point. Higher velocities may be appropriate in operations generating high levels of particulates. Two clean room or clean areas are of particular importance to sterile drug product quality: the critical area and the supporting clean areas associated with it. 1.All clean room classifications are based on data measured in the vicinity of exposed materials/articles during periods of activity. 2.ISO 14644-1 designations provide uniform particle concentration values for clean rooms in multiple industries. 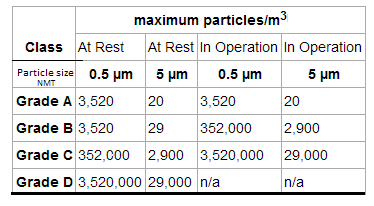 An ISO 5 particle concentration is equal to Class 100 and approximately equals EU Grade A. 3.Values represent recommended levels of environmental quality. You may find it appropriate to establish alternate microbiological action levels due to the nature of the operation or method of analysis. 4. The additional use of settling plates is optional. 5. Samples from Class 100 (ISO 5) clean room environments should normally yield no microbiological contaminants. Environmental conditions that must be designed to maintain pharmaceutical product sterility (CFR 211.42(c)(10)). Activities conducted in such areas include manipulations (e.g., aseptic connections, sterile ingredient additions) of sterile materials prior to and during filling and closing operations. This area is critical because an exposed product is vulnerable to contamination and will not be subsequently sterilized in its immediate container. To maintain product sterility, it is essential that the environment in which aseptic operations (e.g., equipment setup, filling) are conducted be controlled and maintained at an appropriate quality. One aspect of environmental quality is the particle content of the air. Particles are significant because they can enter a product as an extraneous contaminant, and can also contaminate it biologically by acting as a vehicle for microorganisms Appropriately designed air handling systems minimize particle content of a critical area. Air in the immediate proximity of exposed sterilized containers/closures and filling/closing operations would be of appropriate particle quality when it has a per-cubic-meter particle count of no more than 3520 in a size range of 0.5 µm and larger when counted at representative locations normally not more than 1 foot away from the work site, within the airflow, and during filling/closing operations. This level of air cleanliness is also known as Class 100 (ISO 5) clean room. It is recommended that measurements to confirm air cleanliness in critical areas be taken at sites where there is most potential risk to the exposed sterilized product, containers, and closures. The particle counting probe should be placed in an orientation demonstrated to obtain a meaningful sample. Regular monitoring should be performed during each production shift. It is recommended conducting nonviable particle monitoring with a remote counting system. These systems are capable of collecting more comprehensive data and are generally less invasive than portable particle counters. As provided for in the regulations, separate or defined clean areas of operation in an aseptic processing facility should be appropriately controlled to attain different degrees of air quality depending on the nature of the operation. Design of a given area involves satisfying microbiological and particle criteria as defined by the equipment, components, and products exposed, as well as the operational activities conducted in the area. Supporting clean areas can have various classifications and functions. Many support areas function as zones in which nonsterile components, formulated products, in-process materials, equipment, and container/closures are prepared, held, or transferred. These environments are soundly designed when they minimize the level of particle contaminants in the final product and control the microbiological content (bioburden) of articles and components that are subsequently sterilized. The nature of the activities conducted in a supporting clean area determines its classification, clean room classification. FDA recommends that the area immediately adjacent to the aseptic processing line meet, at a minimum, Class 10,000 (ISO 7) standards (see Table 1) under dynamic conditions. Pharmaceutical Manufacturers can also classify this area as Class 1,000 (ISO 6) or maintain the entire aseptic filling room at Class 100 (ISO 5). An area classified at a Class 100,000 (ISO 8) air cleanliness level is appropriate for less critical activities (e.g., equipment cleaning). An essential part of contamination prevention is the adequate separation of areas of operation. To maintain air quality, it is important to achieve a proper airflow from areas of higher cleanliness to adjacent less clean areas. It is vital for rooms of higher air cleanliness to have a substantial positive pressure differential relative to adjacent clean rooms of lower air cleanliness. For example, a positive pressure differential of at least 10-15 Pascals (Pa)(Equal to 0.04-0.06 inches of water gauge.) should be maintained between adjacent rooms of differing classification (with doors closed). When doors are open, outward airflow should be sufficient to minimize ingress of contamination, and it is critical that the time a door can remain open to be strictly controlled . In some cases, the aseptic processing room and adjacent clean rooms have the same classification. Maintaining a pressure differential (with doors closed) between the aseptic processing room and these adjacent rooms can provide beneficial separation. for example a clean room of class 100 which is a aseptic filling aria, laminar air flow bench have higher pressure than its adjustment clean room of class 1000, so that contaminated air do not get in to critical area, In any facility designed with an unclassified room adjacent to the aseptic processing room, a substantial over pressure (e.g., at least 12.5 Pa) from the aseptic processing room should be maintained at all times to prevent contamination. If this pressure differential drops below the minimum limit, it is important that the environmental quality of the aseptic processing room be restored and confirmed. The Agency recommends that pressure differentials between clean rooms be monitored continuously throughout each shift and frequently recorded. All alarms should be documented and deviations from established limits should be investigated. Air change rate is another important clean room design parameter. For Class 100,000 (ISO 8) supporting rooms, airflow sufficient to achieve at least 20 air changes per hour is typically acceptable. Significantly higher air change rates are normally needed for Clean room class of a Class 10,000 and Class 100 areas. Higher the air changes filtration of room is more and eventually the final set operational stage quality of air after required air changes is of good quality. Clean room of classification of class 100 needs about 450 to 500 air changes. A suitable facility monitoring system will rapidly detect atypical changes that can compromise the facility’s environment. An effective system facilitates restoration of operating conditions to established, qualified levels before reaching action levels. For example, pressure differential specifications should enable prompt detection (i.e., alarms) of an emerging low pressure problem to preclude ingress of unclassified air into a classified room. What is a Clean room , its classification of clean room. Clean room- In pharmaceutical manufacturing room is designed and controlled and maintained to attain a highest level of clean environment so as to prevent microbial (bacterial and viral ) and particulate matter contamination of drug products being handled in the clean room. Typically clean rooms are assigned a class depending up on its degree cleanness or its of capability to provide cleanness reproducible and are required to meet an appropriate standard of air cleanliness classification. Clean rooms have great importance in sterile dosage form or injectable dosage form manufacturing. Here is the comparison chart for above two standards. Requirements for designing clean room . This website is pharmaceuticals manufacturers gmp guidelines . THIS IS AN GOOD ARTICLE,IT WELL BE HELPFUL FOR FOR ALL PHARMACEUTICS STUDENTS.COULD YUO PLEASE,SEND A ARTICLE ON MECHANISM OF DRUG INTRACTION? Its really very helpful for pharmacy student and i want to know that can you publish some information on pharmacology related articles like drugs activity,banned drugs,drugs under clinical trials,drugs mostly used in particular disease and so on.. not only on p'cology..it will be informative for us..
this is very usefui article for pharmacy student. this is useful for those who want to make carrier in pharma industry. Good Article For Me Because I Am Fresher Industry. Give A Information About FAT,SAT,DQ,IQ,OQ,PQ As Well As Protocol Of Machine. This is very helpful for gaining extra knowladge . This is a good article . Its a very good article more helpful for sterile production persons. This article is very useful and it is useful for pharma industry individual who want to know details about sterile drugs. Rather this whole website is great on and useful for pharma professionals. Very good article that I have kept referring to it time and time again. Must read, a really good knowledge gain tool, appreciable efforts. Its really very helpful for pharmacy students. This is a helpful article for learning more about area classification.